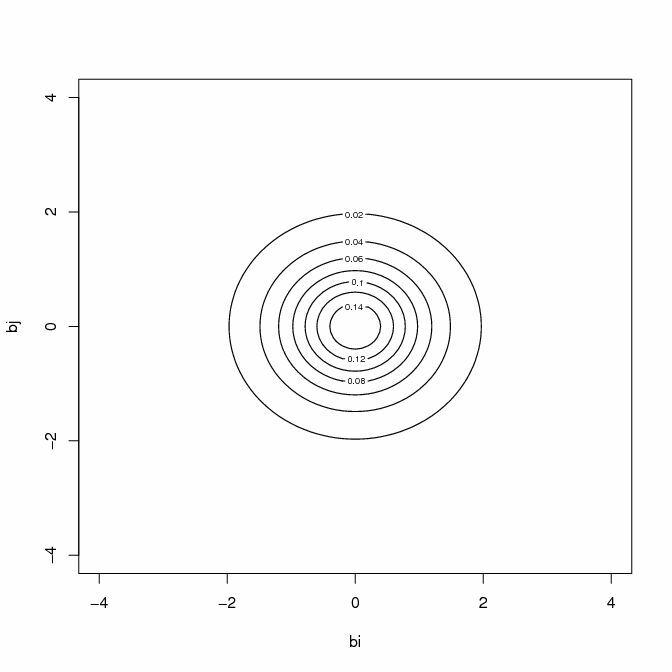 This is just a statement that gives us the probability that a random vector lies in some two-dimensional region, say R. Just as equation (4) can be manipulated to give us the confidence interval in equation (5), the statement in equation (6) can be manipulated to give us a confidence region that has the corresponding interpretation. That is, it will be region whose boundaries are random, and the interpretation will be that if we repeatedly construct such a region many, many times, then such regions will cover the true value of the vector, (βi , βj)’ , 100(1 – α)% of the time. where the elements in the (estimated) covariance matrix, V*, come from the appropriate (2 × 2) sub-matrix of σ2(X’X)-1, in (2). The leading diagonal; elements of this sub-matrix will be var. (bi) and var. (bj), and the off-diagonal; elements will each be cov. (bi , bj ). Given points (i) and (ii) above, in general var. (bi) ≠ var. (bj) and cov. (bi , bj ) ≠ 0.
where V*is the estimated covariance matrix for (bi , bj)’, and V*-1/2 satisfies the relationship V*-1/2V*-1/2 = V*-1. 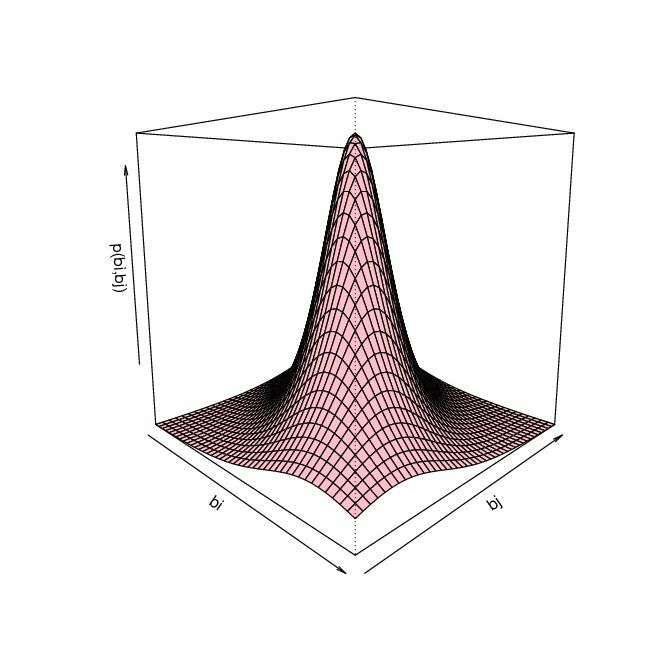 So, in short, what we end up with in (8) is a random vector that follows a bivariate Student-t distribution, and note that the marginal distributions of a multivariate Student-t distribution are also Student-t distributed. 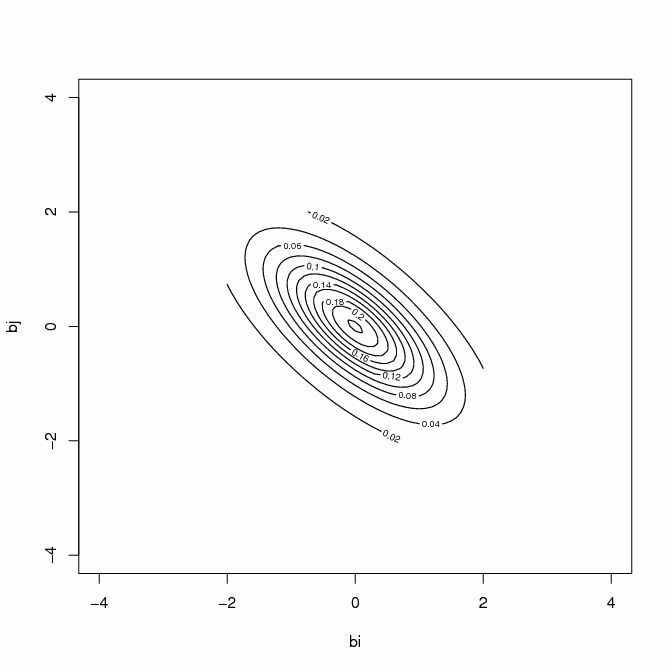 This tells us that when we manipulate equation (6) to get a random confidence region, what we will end up with is a region that is based on the bivariate Student-t distribution. Also, just as the confidence interval in equation (5) was centered at the value of the point estimator, bi, our bivariate confidence region will be centered at the point located by the value taken by the vector point estimator, (bi , bj)’. We can imagine what this region will look like if we think of the underlying density function in the same way that we did in the handout titled “Spherical Distributions” that went with a recent post. In that handout we saw that in the case of a bivariate normal density, with a fixed mean vector, the factors that really mattered were any differences between the variances of the two random variables, and the magnitude and sign of the covariance between them. 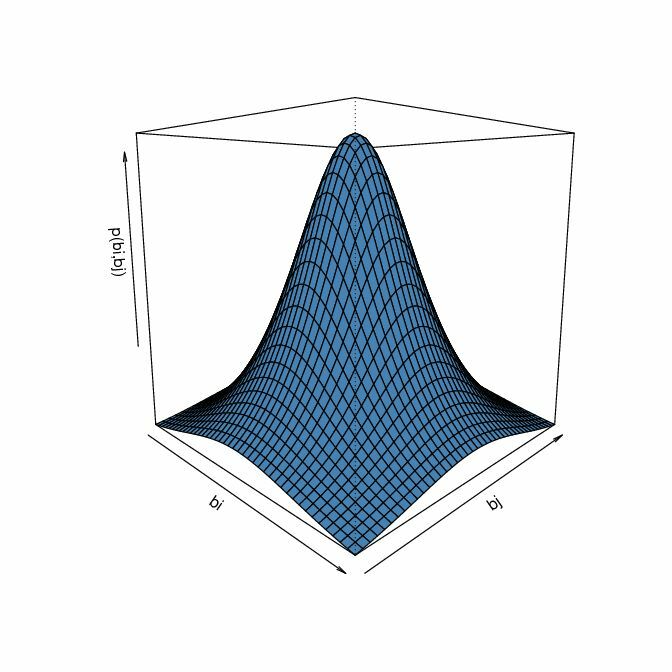 The same is going to apply here when we consider the bivariate Student-t distribution. The variances in this case depend solely on the “degrees of freedom” parameter, which is just (n – k) in our case.